← Will Rio sink along with Petrobras? If those in charge succeed, the controversial top-down term “pacification”, used here since 2008, may soon fall into disuse. Instead, police said yesterday that they are reaching out to civil society to help them do a better, less violent job of keeping Rio safe. Like many big cities in the world. This is not the first such attempt. In the early years of pacification (with Colonel Robson Rodrigues in the post of UPP commander from 2010 to 2011), the program was described as proximity policing (which actually dated back to other pilot programs). But he and other like-minded police officials were sidelined, and priority was given to reaching the stated goal of 40 pacification units in time for the 2014 World Cup — without much concern for the quality of policing these were doing. Many of the measures announced yesterday were included in a 2012 impact evaluation, recently made available in book form. As is evident in an O Globo newspaper interview given by Rodrigues last August and from this blogger’s observation of events over the last several years, police corruption, internal divisions and resistance to change, authoritarianism and a predeliction for violence also posed challenges to police reform. As they do now. This time, however, there is one big difference: top police administrators say that proximity policing will be the policy not only in favelas, but in the rest of Rio — and, indeed, in the entire state by 2018. 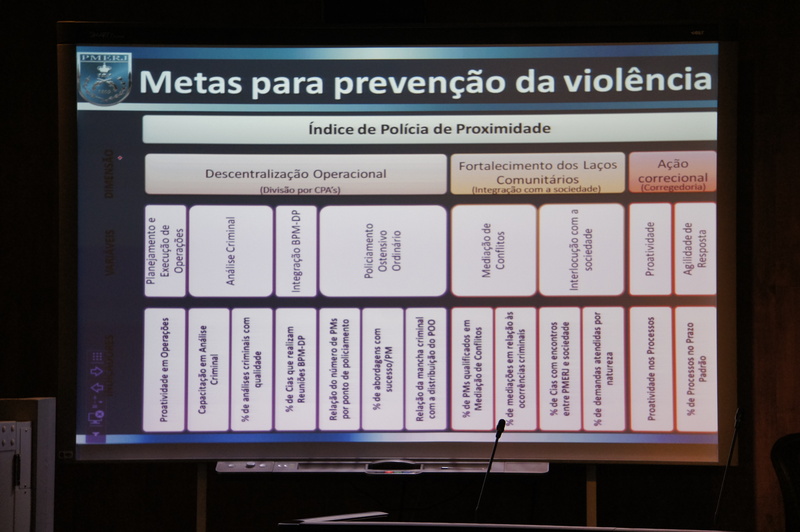 To this effect, the state government is to publish two new decrees next week, one establishing a hands-on public safety council, chaired by Governor Luis Fernando “Pezão” de Souza; and one setting out police goals and monitoring mechanisms. The first “Batalhão Legal” (Friendly Battalion) will be set up in the North Zone neighborhood of Tijuca, and is being presented as a pacification unit on the asphalt, or formal part of the city. Utilizing every available tool (aside from changing an article in the national constitution, which provides for a militarized police force in every state and has drawn calls for revision), the new team seems to be aiming to both seduce and coerce police into adopting new behaviors. Yesterday, they announced improved support for police officers’ physical and mental health, less bureaucracy, decentralization and the use of quadrants to pinpoint and fight crime. At the same time, the new mission statement includes a list of values topped by “hierarchy and discipline” — and notably, new military police commander Pinheiro Neto was previously chief of the force’s tough-guy elite squad, BOPE (check out the NYPD’s values, in contrast). 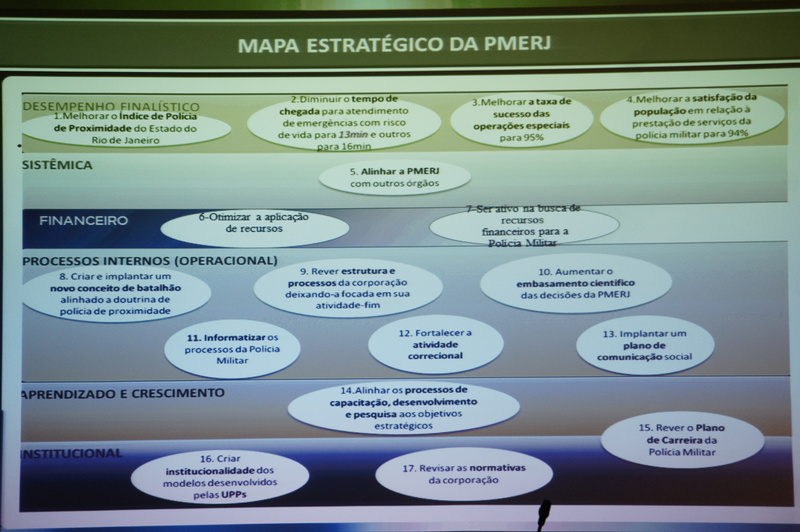 As if all this were not enough to get the troops on the bandwagon, Rio state Public Safety Secretary José Mariano Beltrame took care to note yesterday that 74% of the October 2014 vote in pacified areas went to Governor Pezão, whose election represented some form of public safety policy continuity. “This is a silent measure,” he said, adding that, for many favela residents, the ballot box is the only place where they can safely make their voices heard. Over the long term, pacification has brought crime down citywide, but it went off the rails in mid-2013. Street demonstrations turned perilous, tarnishing an image that police had only recently begun to turn around. Earlier this month, Veja magazine reported that, at that time, a police commander and his subordinates exchanged a flurry of Whatsapp messages glorifying and inciting each other to violence, going so far as to make reference to Nazi Germany. Then came the police torture and death of Rocinha resident Amarildo, followed by an increasing number of shooting incidents resulting in police deaths, in UPP favelas and elsewhere. Crime stats began to spike all over Rio. Perhaps the worst news for the Military Police came last September, with the arrest of 22 officers, including the force’s third man in command, for what amounts to paramilitary crimes (and Beltrame yesterday did hint that more cleansing is to come, saying that “difficult situations will occur in the short term”). The new policy — though presented in an overly long, jargon-filled and barely legible Power Point format — brought applause from audience members yesterday. These included city and state officials, court officials, human rights and NGO representatives — basically just about every individual involved in the struggle to make Rio a better place. Observatório de Favelas director Jailson de Souza e Silva spoke of “renewed hope” — and pointed out that there really is a need for increased state/city coordination, as occupying army troops have been unable to remove food trailers from sidewalks in the Complexo da Maré. 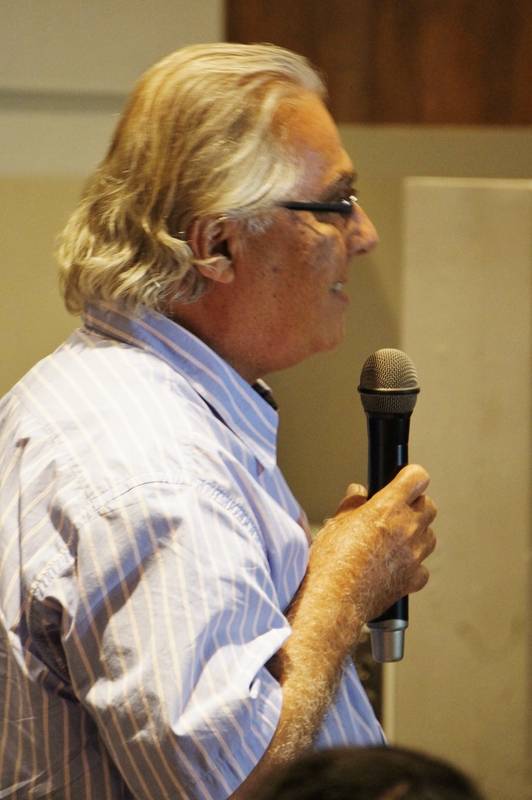 Rubem César Fernandes, founder of the pioneering NGO, Viva Rio, noted that Rio had seen “societal disaggregation” during the recent electoral period and called for faith in a program that he saw as “very promising and very difficult to deliver”. An area yet to be fully addressed is the justice system, which quickly tends to free prisoners, who then return to crime. 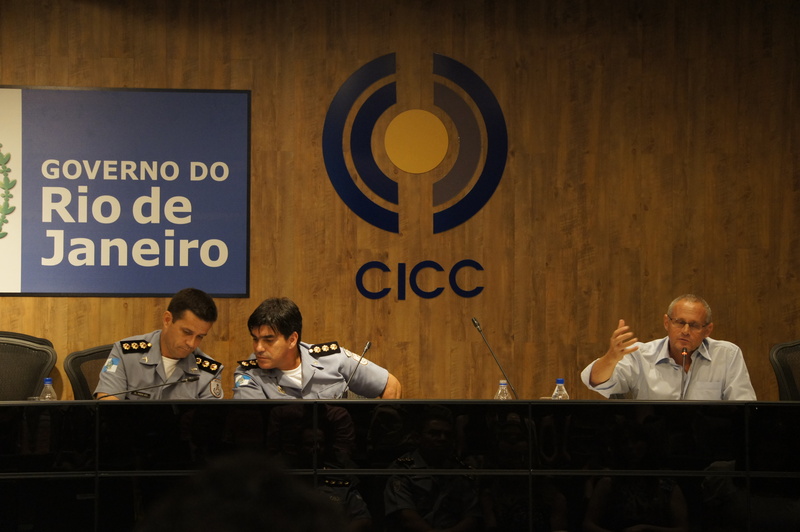 Beltrame noted that Fabrício Mirra, a former military police officer and miliciano convicted of murder, his time served, will be back in the streets of Rio next week. The new policy will also depend on the success of a municipal initiative to partner with civil society and the private sector, towards improved provision of social services, something Beltrame has long demanded. Although Governor Pezão, newly-sworn in, has been announcing significant budget cuts in the face of expected drops in revenue, he’s made clear that public safety is a priority. Strangely however, last week saw reports of short gasoline supplies for cop cars. Given the ambitious goals that the cops announced yesterday, it looks as though this will be the least of their worries (although this possible explanation points to it being part of a larger issue). This entry was posted in Brazil, Transformation of Rio de Janeiro / Transformação do Rio de Janeiro and tagged Alberto Pinheiro Neto, Governor Pezão, Jailson Souza e Silva, José Mariano Beltrame, police pacification rio de janeiro, proximity policing Rio de Janeiro, Rio de Janeiro state budget cuts, Rio Military Police, Rio police, Robson Rodrigues, Rubem César Fernandes. Bookmark the permalink. Informstive as ever – thanks! And a well-deserved award!